We have combined some of our most wanted designs with popular quotes. Which of these hangings fits on your wall? 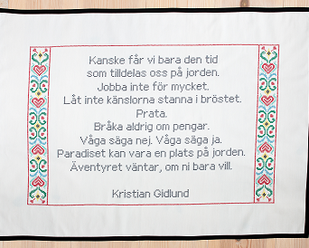 All our pre-made hangings are machine embroidered in Sweden by The Folklore Company - on ecological fabric of 100% cotton and with quality yarn of the brand Madeira Classic. If you rather want to design your own personal wall hanging – click here.